At Cinegear G-technology’s Greg Crosby gave Newsshooter’s Clinton Harn a sneak peak at their future Atomos compatible products. They are making a special adapter that will fit Atomos drive caddies into the G-technology EV dock range. The adapter is similar to the existing RED SSD adapter and should make transferring date from your recorder a very simple affair. The Atomos adapter also has a handy USB-C port should you want to connect a caddy directly to a computer. 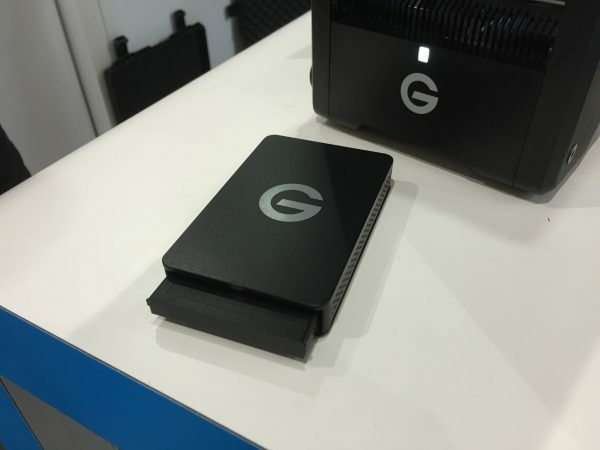 G-technology also said that they are looking at making media specifically for Atomos products and talk about new SSD drives they hope to integrate. For more info keep an eye on the G-technology website. Full disclosure: Clinton Harn and Dan Chung are G-team members.